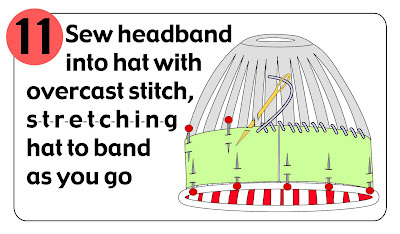 There are really two methods of lining a hat--the headband method and the fully-lined method. The fully-lined method is warmer, while the headband method is less bulky and suits active folk well--more heat can escape from the crown of a hat lined by the headband method than from a fully lined hat. Today's post shows the headband method, while the full-lining method is described here. 1. 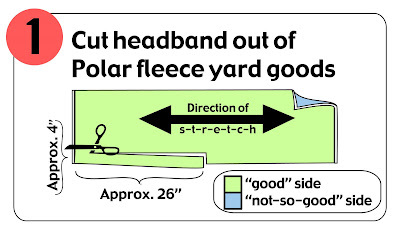 (above) The first step is to cut your headband out of Polar fleece yard goods, as shown. 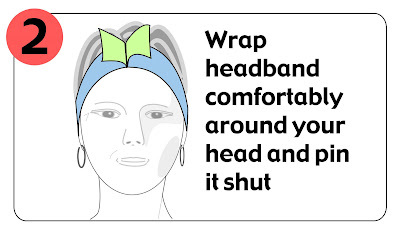 The illustration suggests a 4" deep headband, which is generous. Some folks prefer a narrower headband, so experiment and see what suits you. Polar fleece is pretty cheap, so there's no real reason to be sparing with it. 2. (above) Once you've cut your headband strip, the method illustrated here lets you go forward without taking any further measurements--everything from here out is done intuitively, and the tape measure can be put away. For example, the headband strip for the lining is sized by wrapping it around your forehead and pinning it shut. Experience shows that it's best to wear the pinned headband around the house for a little while before you commit to sewing it shut. What seems comfortably snug at first can seem ear-numbingly tight after a quarter of an hour. 3. 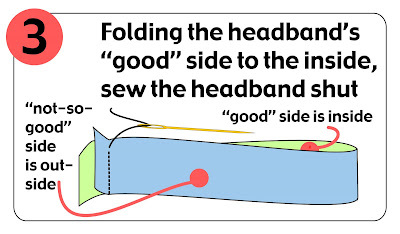 (above) When you're pinning the headband, arrange matters so the "good" side (green side) is on the inside and the "not so good" side (blue side in these illustrations) is on the outside. Then, once you have the length correct, sew the headband shut across the short end. 4. (above). 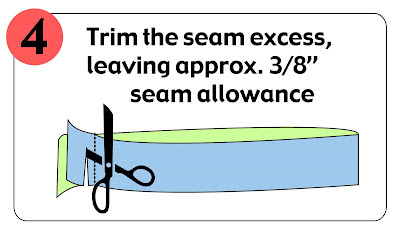 Trim away the excess fabric at the seam. If you find a standard 3/8 inch seam allowance too bulky, you can cut it closer--Polar fleece does not unravel or fray, so you can get away with narrower seam allowances if you prefer them. 5. 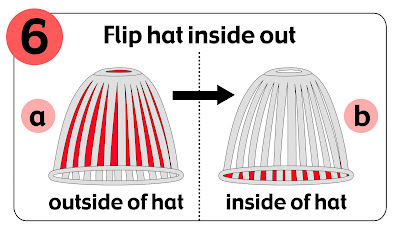 (above) Because you want to see the good side of the fabric when you peer inside your hat, you must put the not so good side against the inside of the hat. Therefore, flip the band inside out so the seam allowance (and the not so good side) are on the inside of the band. 6. (above) Flip the hat inside out, also. 7. (above) Slip the headband over the hat. If the hat has a back--a seam, perhaps, or a little knitting error you don't care to display on your forehead--align the seam of the lining with the hat back. 8. (above) Illustrations can take you just so far. For reality, there is nothing like a photo. As you can see from this photo, it often happens that the headband is far, far wider than the hat itself. This is because the hat is likely to "draw in" more than the band, especially if the hat is in a contoured fabric like ribbing. While this may look worrisome, it really isn't a problem, as you can see by skipping ahead: illustrations 12 and 13 are the "after" photos of this same hat. 9. (above) The next step is to pin the hatband inside the hat. Make sure to tuck the seam allowance flaps inside and smooth them down at this point. a: holding the hat (gray shape) inside the lining (blue shape), S-T-R-E-T-C-H the hat and the lining with both forefingers into a long shape which can be stretched no further. 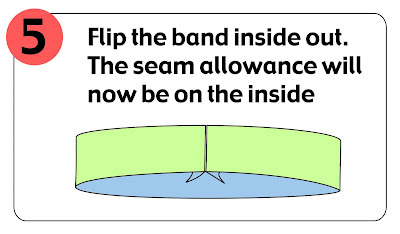 This automatically centers the hat inside the band. Pin the band to the hat in these two spots--a 4 inch headband may require two pins at each contact point (as shown in illustration 11), a narrower band may require only 1 pin at each contact point. Do you wonder how you can pin in the headband while your hands are inside the hat and band, stretching everything smooth? You can ask someone to help you, of course, but if you are alone, you can take a shortcut by pinning in one contact point BEFORE you start the stretching-out process, then pinch the hat and lining together where you find the second contact should go. Just be sure not to prick yourself with the pre-set pin, which would go right against one of your stretching fingers. 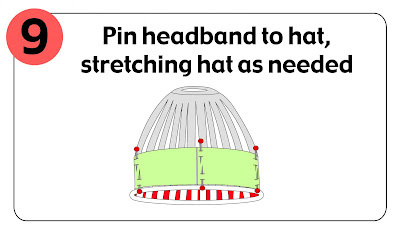 b. along one side, divide the length between the two pins in half by again stretching the hat and the lining until they can stretch no further. Pin this third contact point. c. along the other side, repeat step b. Four points are now pinned. d. again stretching between two contact points, set a fifth contact point at the half-way mark between two already-set pins. 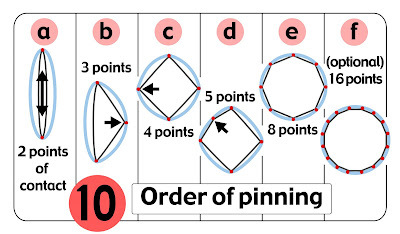 e. repeat the "stretching to find the half-way point" 3 more times until a total of 8 contact points are securely pinned down. f. the perfectionists among us may want to again halve each side length for a total of 16 contact points. I myself wouldn't bother unless the hat was very large, smooth and light--a large man's cap knitted from sock yarn, perhaps. If the band was far wider than the hat, as in illustration 8, you will find that the band is puckering where it is pinned onto the hat. This is normal, so don't worry. 11. (above) Now we come to the sewing. The trick here is to smooth the hat to the band by stretching as you sew. 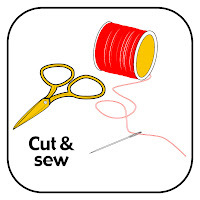 Use a sharp-pointed needle and polyester sewing thread. I use a single strand, but some folks prefer a double strand. The fact is, polyester sewing thread is very, very strong. So strong, that it could end up cutting the woolen yarn of your hat if you are not careful about tension. You do NOT want to pull the thread up so tight that there is no slack--this is what causes the thread to want to cut the yarn. On the other hand, you also do not want to to sew so loosely that loops of thread lay inside the finished hat. Practice makes perfect in this, as in so many skills. The best stitch for sewing linings into stretchy woolens is the overcast stitch (also called the whip stitch). This overcast stitch is particularly good because it allows a bit of extra thread to remain in the fabric, allowing for stretching without popping the thread or tearing the knit fabric. The overcast stitch is also an excellent choice because the thread "tethers" the two pieces of fabric (hat and lining) together, rather than fastening them unmovingly to one another. An analogy from woodworking would be a carpenter attaching two pieces of wood together with short lengths of chain rather than nailing them together. Nailing would be stronger, but the chain more flexible. In the same way, "nailing" the lining onto the hat with a firm stitch like the back stitch would be strong but inflexible, so that the thread might tear as soon as one fabric stretched more than the other. If you click on illustration 11, it will enlarge enormously, and you can see a closeup. At the hat edge, you'd want to pierce right through a strand of yarn--use the sharp point of the needle to catch two plies of a 4-ply yarn for example. HOWEVER, catching that little dollop of fabric from the face can be frustrating with fleece, because sometimes your needle just catches fuzz, instead of scooping up the little dollop you want. So, although, the rolled-in edge is very beautiful, don't let frustration and this sort of perfectionism stand between you and a lined hat. Sew the headband in by whip stitching right through the cut edge of the Polar fleece and to heck with it! This stitching is inside a hat, after all. 12. (above) Here is the final result from the inside. As you can see, the excess width of the band, as shown in illustration 8, has been eased to the hat. When the hat is put on, all those puckers disappear, and the hat lies smooth against the head. 13. (above) There is something of a line where the edge of the headband lies. If you don't care for that look, here is a post about a method for fully lining hats with Polar fleece. If you're a hand-knitter who's never used Polar Fleece, you have a wonderful surprise waiting for you! Although it is not without drawbacks, Polar fleece is EXCELLENT when used in small amounts for lining hand knits. THIS TECHknitting post shows how to line a hat with a polar fleece, headband style, while THIS TECHknitting post shows how to fully line a hat with Polar fleece without measuring anything, just by using your head and your finished hat as the template. But before all that, here is a free-standing write-up on just what Polar fleece is, its advantages, disadvantages, and characteristics. Polar fleece is the name for a certain type of fuzzy, stretchy KNIT yard goods invented by Malden Mills. (Malden Mills, you might remember, is the corporate feel-good story of the 1990's. When the factory burned down, the owner, Aaron Fuerstein, didn't close down or move overseas: he used millions from his insurance money to keep the workers on full pay and benefits as he rebuilt the mill). 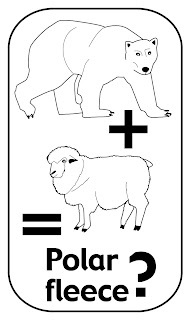 The company was eventually sold, and is now called Polartec LLC, with "Polartec" also being the brand name of their very premium fleece. You can buy generic fleece at big-box fabric stores, and that kind is good enough for linings. If you want the really good stuff, Polartec brand fleece is available at high-end stores as well as on-line. Polar fleece is also called "microfleece," although (confusingly) this name is also used to indicate thinner yard goods, like those used for undershirts or pajamas. Fleece is an entirely synthetic fabric made from PET plastic, often from recycled soda containers. The plastic is heated, then turned into thread by extruding it through shower-head- like nozzles. Giant machines then use this extruded thread to knit enormous tubes of fabric, usually with with loops on both sides like a towel, although single-sided fleece continues to be produced. The loops are "napped" into fuzziness by more giant machines, then trimmed to a uniform length like a velvety shag rug. (Read more here.) Fleece is made in different thicknesses, with the medium thickness (called "200 weight") being the most all-around useful. 4. NOT ITCHY: Polar fleece is well-tolerated. Most people don't find it itchy at all, not even pressed against ears or neck. Picky little kids who flail and fling themselves to the ground at the approach of a disliked garment don't scream or fuss at the touch of Polar fleece. 5. DRY: Polar fleece "wicks." This means that it draws moisture away from your skin. Even after WAY too many hours of sweating into a Polar-fleece-lined hat on a cross-country ski slog adventure, your forehead will be dry, long after the woolen outer shell is soaked. 6. 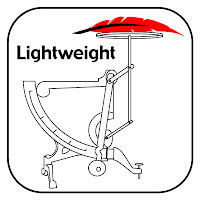 LIGHT-WEIGHT: if you line a hat with Polar fleece, you won't notice any additional weight. 7. EASY-PEASY TO WASH: washing Polar fleece couldn't be easier: It doesn't shrink, it's tough enough to be endlessly machine washed and dried, yet it sheds dirt so easily that hand-washing with a swish through sudsy water cleans it just as well. Therefore, fleece is suitable to line any sort of hand-knit hat, ranging from the most delicate "hand-wash-dry-flat" mohairs, through hardy superwash wools, and all the way to bombproof wash'n'dry acrylics. 8. CHEAP: a quarter yard won't set you back more than a couple of bucks, and will line a whole bunch of hats in the headband style, and even a couple of hats in the fully-lined style. That's because this stuff is seriously WIDE -- somewhere around FIVE FEET -- the denser stuff measures 58 inches, while the thinner stuff measures up to 68 inches wide. With so many excellent qualities, you just KNOW there are some downsides, and so there are. 1. 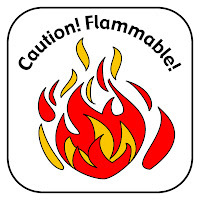 FLAMMABILITY: This is the very biggest disadvantage. Regular Polar Fleece is horribly flammable. Just like the plastic it is made of, it goes up like a torch. Nowadays, there ARE fire-retardant fleeces (mainly for military and fire-fighter use) but you have to really hunt for these. It is for fear of fire that I, personally, feel best about using Polar fleece in small amounts. Specifically, I use it mostly for lining the inside of nice, safe wool hats, with the wool on the OUTSIDE. Certainly, I would never, EVER sew a non-flame-retardant fleece garment for an infant. 2. NOT GENERALLY WIND RESISTANT: nowadays, it IS possible to find windproof fleece, but, like the fire retardant ones, you really have to hunt for these, and when you find them, they're rather thick and stiff. Ordinary fleece, like that at big-box fabric stores, lets the wind through. As a lining for a close-knit woolen cap or under a windbreaker, no big problem--for a garment on its own, avoid! 3. STICKY: most linings, especially arm linings, are slick, which is why you can pull your ski jacket or dress coat over a woolen sweater. In a small garment like a hat, a Polar fleece lining is no particular problem, especially as hair is fairly slick. However, an outerwear jacket lined all in fleece would be nearly impossible--you'd stick like a bug in a web as any sweater you were wearing tangled with the fleece jacket lining. 4. 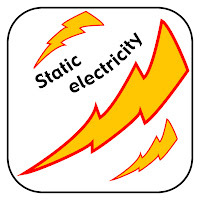 STATIC-Y: fleece is very static-y, more static-y than any wool, and the electric shock factor in dry winter air can be VERY annoying. This is another factor which usually leads me to restrict the amount of Polar fleece in garments I make. 5. MELTS! Polar fleece will melt under the heat of even ordinary ironing. This means that steam blocking an wool hat lined with fleece is out. Avoid the iron and wet-block, instead. To be sure, other than the fire issue, the good FAR outweighs the bad. Polar fleece is as close to a miracle fiber as you can get, and WILL look good as a headband lining or a full lining in even the fanciest hand-knit hat. Even if you never thought of using it before, if you should ever find yourself in a fabric store, snag a quarter yard to mess around with, and see for yourself. 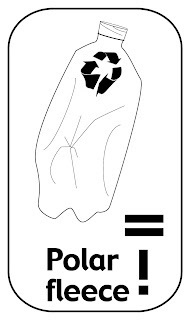 As stated above, Polar fleece is knit in giant tubes. After the tube is knit, it is slit open. 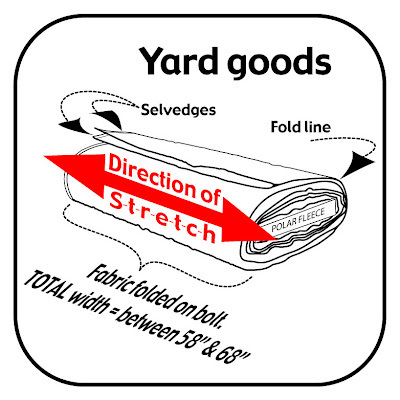 When the fabric is finished, it is folded in half and wound onto bolts to become "yard goods," (fabric sold by the yard, rather than the piece or panel). At that point, the slit-open edges are the LONG edges of the fabric. These lengthwise edges--the "selvedges" of the material, are not napped (not fuzzy)--they are naked looking. The BAD thing is that, since the edges were slit open, and because they are all naked-looking, they are a bit raggedy. This means that, unlike woven cloth where the selvedge is a valuable part of the cloth (because it doesn't unravel) you wouldn't want to use a fleece selvedge right at the edge of a lining, where it might show. If a selvedge are still attached to the piece of Polar fleece you plan to use, either cut it off, or fold it under and sew it to the inside--between the lining and the hat. The GOOD thing about the naked, un-fuzzy selvedges is that you can use them as landmarks when you come to sew with Polar fleece. To explain: The S-T-R-E-T-C-H of Polar fleece is directional--it stretches a great deal from side to side (from selvedge to selvedge) but stretches far less along the length. 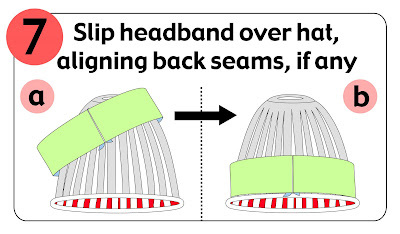 BE CAREFUL that you cut a headband-lining or a full lining so the direction of stretch is going AROUND your head (the long way of the headband-lining) NOT "up and down" on your head. Having the stretch go AROUND you head will be far kinder to your ears and forehead! 1. the (expensive and relatively rare) fancy kind that is really two different fleeces fused together--a truly reversible fabric, which may even be a different color on each side. 2. the (far more common) "regular" kind which has a thicker "good side" and thinner not-so-good side. On "regular" double-sided fleece, the good side pills less and is denser and nicer than the not-so-good side. 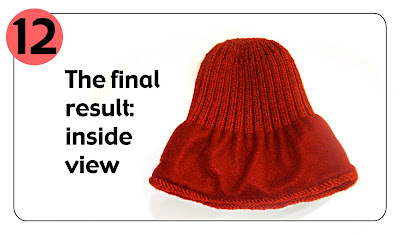 To tell the truth, this ISN'T VERY IMPORTANT for lining a kid's hat, or a sweater for the dog. But if you're lining a hat for the new boyfriend, or that fancy creation to hand around at your next guild meeting, you probably want to keep track of which side is which. Usually, you can tell by just looking and feeling--the denser fuzz is on the good side. If you're unsure, ask the nice ladies at the fabric store to tell you, then mark the good side with a pin or a piece of tailor's chalk. Another thing hand-knitters can mostly ignore is "nap." This means that the little velvety cut loops, the "fuzz," runs directionally. If you're sewing two pieces together, it would look more pleasant if the nap caught the light the same way--if it ran the same way on each adjoining piece. For 99% of handknit lining applications, however, you can ignore nap--this info is just here so if you decide to abandon knitting & take up sewing as a hobby, you'll be all set. Next time: how to line a hat with a fleece headband. 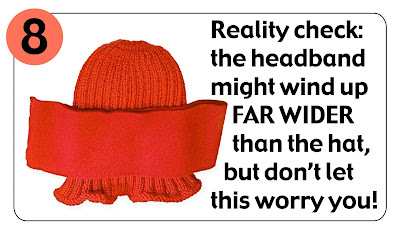 Have you a woolen hat* which is itching your (or someone else's) forehead? You could line the hat with polar fleece in a headband style or in a fully lined style. But before you go to the trouble to line your creation, today's post will show an easy solution you might want to try first. 1. If the hat needs to be washed, wash it gently in tepid (room temperature) water, then rinse, in the same temperature water, until all the soap suds are gone. If the hat does not need to be washed, then simply soak the hat in tepid water until it is completely wet. 2. Gently press all the water out. Make up a new basin of water of the same temperature, and into that basin, dissolve a tablespoon or two of hair conditioner. 3. Swish the wet hat through the solution, then let it sit for about 5-10 minutes. Again gently press out the water. Do not rinse out the conditioner. 4. BE CAREFUL not to agitate the hat or felting will result. Swish, swish, swish--that's all you need to do. 5. Roll the item in a heavy towel, step on the towel/hat jelly-roll to press out all the water,unroll, then lay the hat on another, dry, towel. Pat into shape and let dry. Some hair conditioner leaves a sticky trace, some does not--if it leaves your hair feeling sticky, it'll probably leave your hat feeling sticky, so use a different kind. Conditioner that leaves your hair soft and smooth will do the same for your woolens. 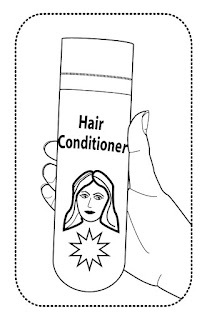 Also, the kind of hair conditioner to use for this trick is the ordinary supermarket kind for "normal hair." Specialty hair conditioners (volumizers, curl releasers, chemical damage-repair conditioners and the like) may have odd interactions with wool. If in doubt, try your conditioner on a swatch, first. 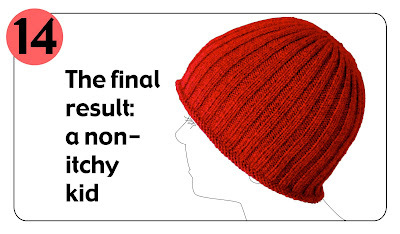 If you try this trick and it does not sufficiently "de-itchify" your hat for you, then click the links at the top of the column for information about lining knitting with polar fleece. * Of course, this trick works for all woolen garments, not just hats. Scarves and mufflers--in contact with delicate neck skin--generally benefit from conditioner's softening properties, and this works for itchy sweaters, too.